The girls arrived to camp at noon on Monday in very hot, muggy weather. That night a storm raced in and blew away the lingering humidity and replaced it with a cool breeze. A wonderful analogy for what appears outwardly in the hearts of unwary teen girl campers! 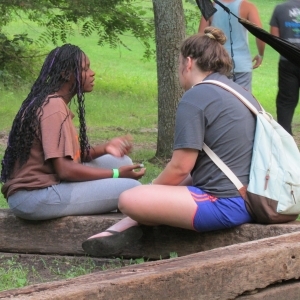 After the initial chaos of arrival, unsure faces were replaced with smiles, aloof body language relaxed and communication commenced between counselors and campers. Seeing God’s little miracles of changed attitudes, softness between people and an air cleared by His love was one of the best parts of camp itself. Pictures were taken of girls conquering fears as they paddled canoes, pulled hooks from the mouths of blue gills and set up tents. Triumphantly, several girls mastered their dread and touched the slimy surface of a fish for the first time and patiently, counselors instructed others to set-up tents. Camp was a wonderful place for these ladies to learn these new skills, to try something out of character and become someone different. In an isolated, sacred place; campers, counselors and staff alike put on different hats to try to explore the person God created them to be and to stretch their learning curve until the thinness makes them want to hold fast to something unchanging….God Almighty. Ms. Kalie served the camp many ideas in chapel; with her passionate preaching, she challenged them to allow God to heal their wounds into scars, pointing out that scars are God’s way of using wounds to draw close to Him and to minister to others. She also expressed that forgiveness is the step towards healing—an extremely difficult process. Many girls seemed to begin the process of this journey by opening up. After chapel, before the chaos of the “egg war,” there were many tears from girls touched by the chapel message. As camp finally entered a routine, it seemed unfair that the week was coming to a close. Walls around campers lowered slightly and everyone entered a comfort level with each other. 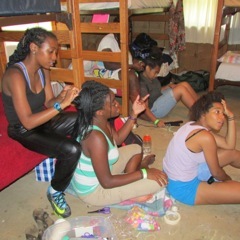 The last day for teen girls at Camp CUMCITO was a relaxed day. Since so much had been stirred up in their hearts, it gave them time to reflect as well as prepare for the week’s end banquet and special chapel. It seemed they’d found a joy after wrestling with what had been placed before them while other ended the week still struggling, their faces unable to hide their battle. 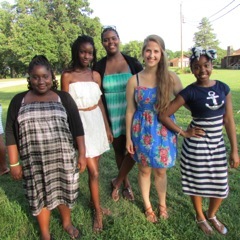 Most every girl at camp reveled in the process of dressing up for the banquet. Their beauty in preparing themselves for the feast, couldn’t help but remind the staff of the all the analogies of brides preparing for wedding feasts in the Bible—a comparison of the relationship between the church and Jesus. 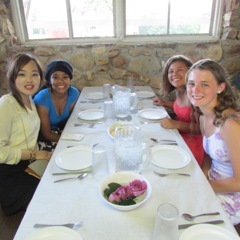 The banquet and chapel at week’s end was a celebration of the girls, their scars, and the process of overcoming with a relationship with Jesus. For some learning was expressed through a presentation o f a poem. One of 16-year-old campers shared about her abuse and self-loathing and gave hope to younger campers. Others (who essentially graduated camp this summer), gave testimony and words of thanks for counselors and fellow campers who listened. The dance/drama team shared a moving number portraying Jesus setting captives free from their past. 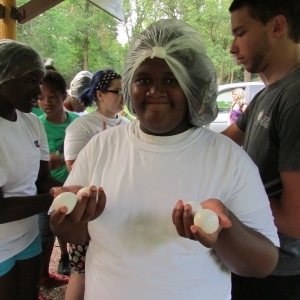 Other campers revealed their growth as well, not through words, but through actions. One camper who was struggling with development had her entire cabin rallying behind her for the entire week. They cheered her on and one of them even wrote her a letter from “Batman” and had it delivered at lunch, to her great delight.